• Combining the beauty of LED lights with high performance memory allow gamers to create a highly personalized experience. • The RGB lighting effects and soothing breathing illumination is the perfect integration of natural art in technology. 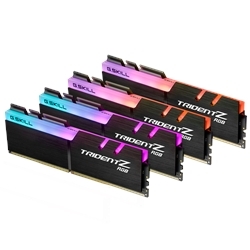 • First RGB memory to offer DDR4-4266MHz speed. • First RGB memory to set world record speed at more than DDR4-5500MHz. • First RGB memory to offer cordless power. • First RGB memory to offer 5 independent color zones per module. • First RGB memory to offer 11 customizable lighting effects via G.SKILL Trident Z RGB lighting control software. • Intel & AMD platforms compatible. • System lighting sync supported by ASUS Aura, Gigabyte RGB Fusion, MSI Mystic Light.